Project Management Fundamental Training Materials are designed for introductory-level skill development for project management. Train your staff and managers on the benefits of projects, how to sell a project, create a vision, prepare goals and more! 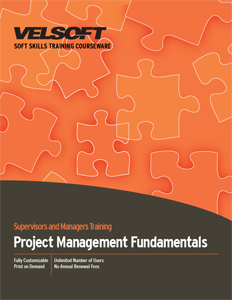 Seeing is Believing This sample manual to teach Project Management Fundamentals is in MS Word format. This project management course includes just what people getting involved in their first project or two need to get started. This one-day course includes the definitions for projects, the project manager, and the members of the project team. Benefits of project management to one's career, project life cycles, stages, priority matrix, and more are all included. Our interactive training materials include a pre-assignment, detailed instructor guide, student guide, pre- and post-assessments, quick reference guide and more. If your students like to learn from their mobile devices, ask about our blended learning (www.velsoft.com).